Oregon Grape root has been used traditionally to support the bodys ability to resist infection. 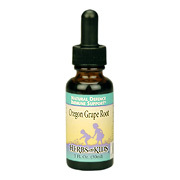 Rich in berberine, Oregon Grape root is a powerful herb to have on hand when the little ones start to sniffle! Take directly or mix drops in small amount of pure water or juice and drink. Formulated for children over one year of age. 1-2 years (up to 24 pounds): 15-20 drops (.7ml.-1ml.) as needed up to 3 times a day. 3-6 years (24-48 pounds): 20-40 drops (1ml.-2ml.) as needed up to 3 times a day. 7-11 years (49-95 pounds): 40 drops (2ml.) as needed up to 3-4 times a day. 12 years to adult (over 95 pounds): 60 drops (3ml.) as needed up to 3-4 times a day. A 1.0 ml proprietary blend of an extract of Oregon Grape root. Other Ingredients: Kosher Coconut and/or Palm kernel glycerine, purified water and citric acid. Herbs for Kids was founded in 1990 by herbalist and expectant mother, Sunny Mavor. Sunny has been involved with botanicals for nearly fifteen years. She has counseled and taught about the joy of herbs at stores, schools, and symposiums across the nation. With a background as a practicing herbalist and in retail natural food management, she knew the difficulty of finding herbal products acceptable for children. She wished to create an alternative to alcohol-based, and most adult formulas often use herbs too strong for children. Capsules, tablets and teas are difficult to administer. So Sunny created the first company dedicated to Earth-reviving herbal health care for children. Her background as an herbalist assures that our alcohol-free blends are gentle, safe, and effective; her sense as a mother led her to create a great taste for Herbs for Kids. Even the most bitter of herbs are blended to have a flavor that goes down with smiles. Hundreds of thousands of bottles later, Herbs for Kids remains the premiere line of traditional herbal extracts for children. It is the largest and most effective product line available. Oregon Grape Root Alcohol Free is shipped in a discrete, unmarked package. Orders are processed immediately and usually take about 3 to 5 working days to be received. We do ask that you try it for 2 to 3 weeks to feel the full effects. Any information received is used only for order processing and shipping purposes. Your information, such as e-mail address, will never be disclosed to a third party.